If you like the striped shirt above - I found this one on sale for under $20. And, I found this cute yellow lace dress. I ordered these sneakers - I want to see if they are comfy as everyone says. I might order this cardigan for spring. This vintage (classic) tee is on sale for only $8. I just bought these jeans - everyone says they are great - so we will see. I love following this designer - I think they are some of the funkiest clothes. The cutest ruffle gingham dress. This cute knotted front tee is 20% off. A bell sleeve lace blouse - in a great color. This Canadian designer makes some of my favorite blazers! I like this camo sweatshirt that is 40% off. This shiny lipgloss is my favorite. These cute tie waist pants (in a great color) are 50% off. Also, I shared my 10 must-haves for spring here. I love that yellow dress! 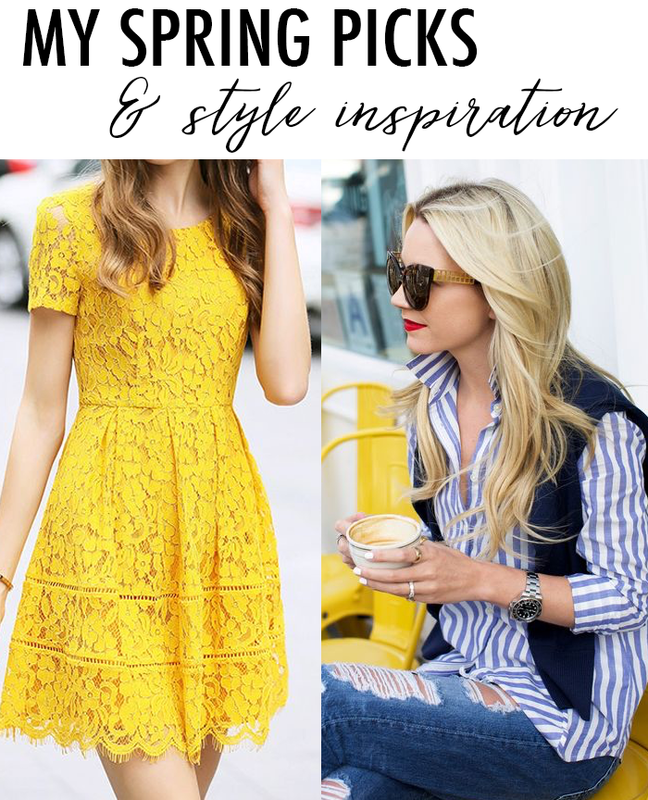 I think of my favorite things about spring style is the lace dresses! Oh, I hope those sneakers end up working!